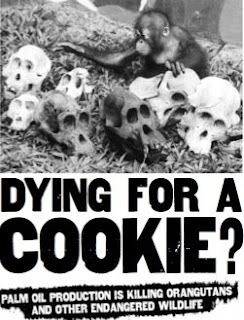 Here are some videos to help you change your mind if you still feel okay about eating those cookies or candy bars with palm oil in them, or washing up with some of your favorite soaps! CHECK THE INGREDIANTS! Don't buy products with Palm Oil! Even if you don't care about the orangutans or global warming - its no good for you anyway.